California tops many lists that make us proud but there are some we would rather not be on at all – let alone lead. The fact that we lead the country in fatal pedestrian accidents is an example. Read on to find out more about what is causing our high number of fatal pedestrian and bike accidents. If you are or have been injured in an accident in California, then you should contact Law Offices of Michael A. Kahn at (310) 209-1600 now for a free legal consultation. Drivers have a legal responsibility to follow the laws and to take their own reasonable care when driving to avoid injuring others. However, drivers act negligently on a regular basis. For example, they may speed, drive while under the influence of drugs or alcohol, or text while driving. Any of these behaviors can lead to an accident. The driver has an even higher duty of care when driving where kids are, such as within the vicinity of a school. Pedestrians have duties of their own. They are required to cross at crosswalks and to follow “walk” and “don’t walk” symbols. In some cases, pedestrians walk out into traffic while texting or on their phone and are partially responsible for their own accident. The reason that pedestrian accidents are so often fatal or catastrophic is because victims do not have any protection. Even when a person is struck on a bike, they likely have a helmet on. Pedestrians, on the other hand, have nothing to protect them. If they survive the accident, they could end up with astronomical medical costs, an inability to continue working, lifelong pain and suffering, and other issues. When the victim dies, then their close relatives who were dependent on them for support may be able to file a wrongful death lawsuit to recover damages. This wrongful death case could also cover the final medical expenses as well as funeral and burial expenses of the deceased. Other potential damages in a wrongful death case include loss of companionship, loss of financial support, and loss of household duties. A recent study looked at pedestrian accidents within one-half mile of each of the elementary schools in San Diego. The results were not surprising: Schools in urban areas with more traffic and more pedestrians had more accidents than schools in more rural and residential areas. For this reason, experts suggest that children under ten do not walk alone to school, that people only cross at crosswalks, and that citizens work to find the path to their destination that involves the fewest street crossings. 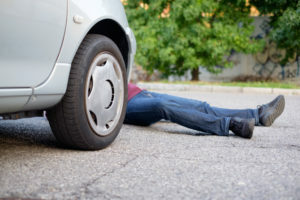 If you have been injured in a pedestrian accident then you may be entitled to damages. At Law Offices of Michael A. Kahn we can help you find the best way forward. Contact our offices now at (310) 209-1600 for a free legal consultation.